With nothing but time to enjoy the little things, we’ve been exploring some areas close to home that we’ve previously ignored. 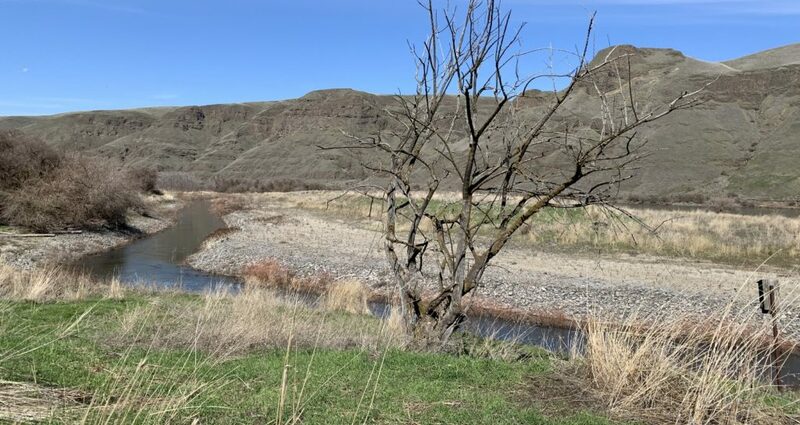 This week’s new location was the Asotin Slough Wildlife Habitat Unit at the southern end of Asotin. Over 115 species of bird call this Army Corps of Engineer location home. 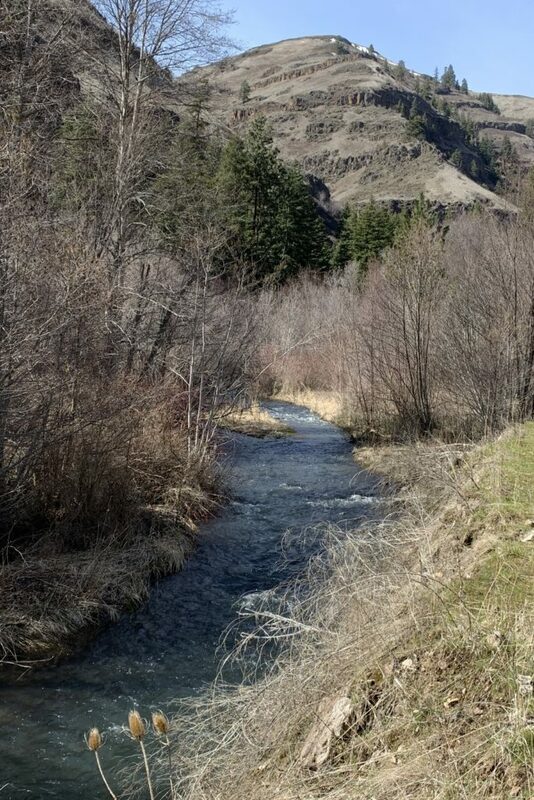 During our two mile hike we enjoyed fine Snake River views and saw belted kingfisher, ring-necked pheasant, osprey, wood duck, mallard duck, black capped chickadee, and California quail. 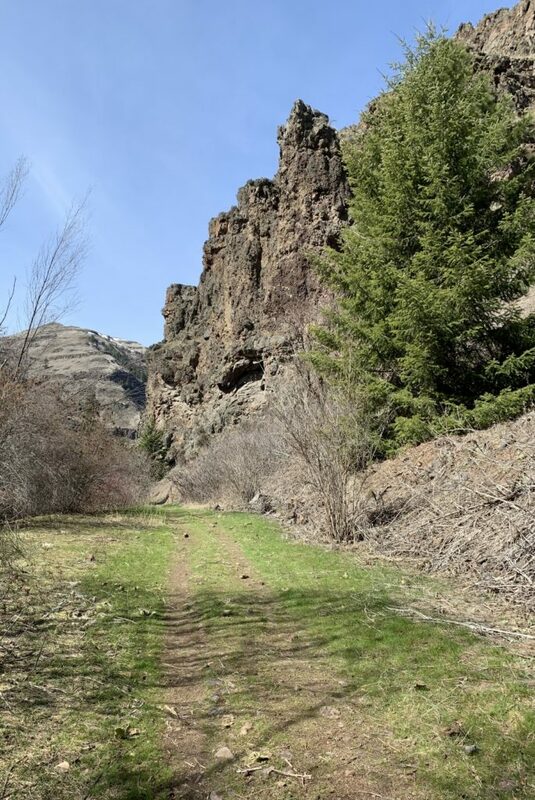 We took advantage of a sunny day to hike our favorite local trail, North Fork of Asotin Creek. 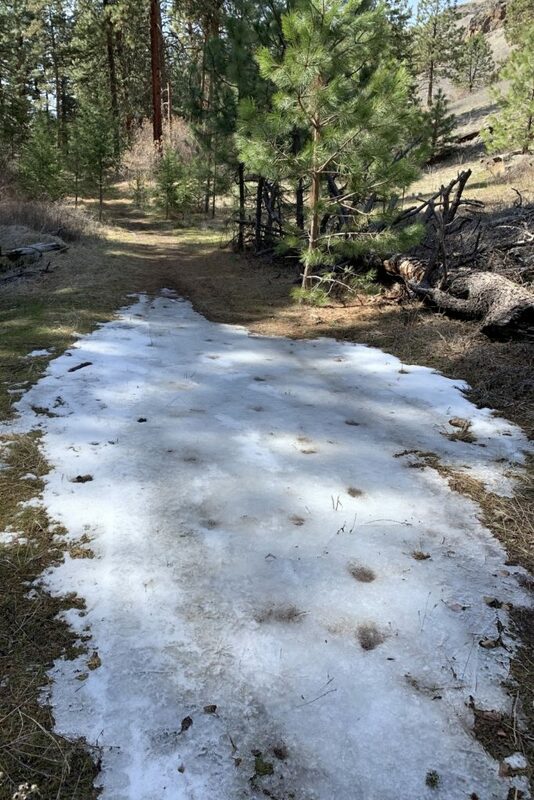 We love this trail for its year-round accessibility and nearly guaranteed chance of spotting Rocky Mountain bighorn sheep. I’ve blogged about this trail in detail, so I’ll just mention the highlights of the day. After a winter of short hikes, it felt great to get some distance on our feet and legs. We hiked nine miles with near perfect hiking conditions. 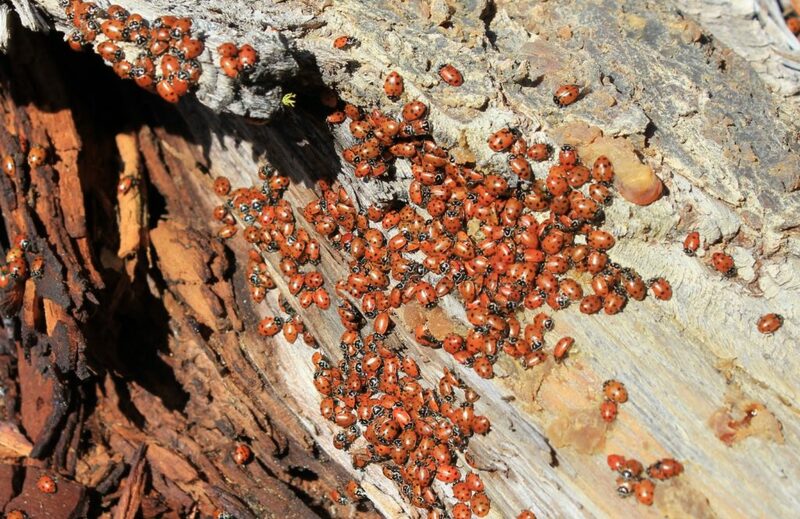 The lady bugs were enjoying conditions even more than us—thousands swarmed the trail. We only spotted three bighorn sheep, a light day. 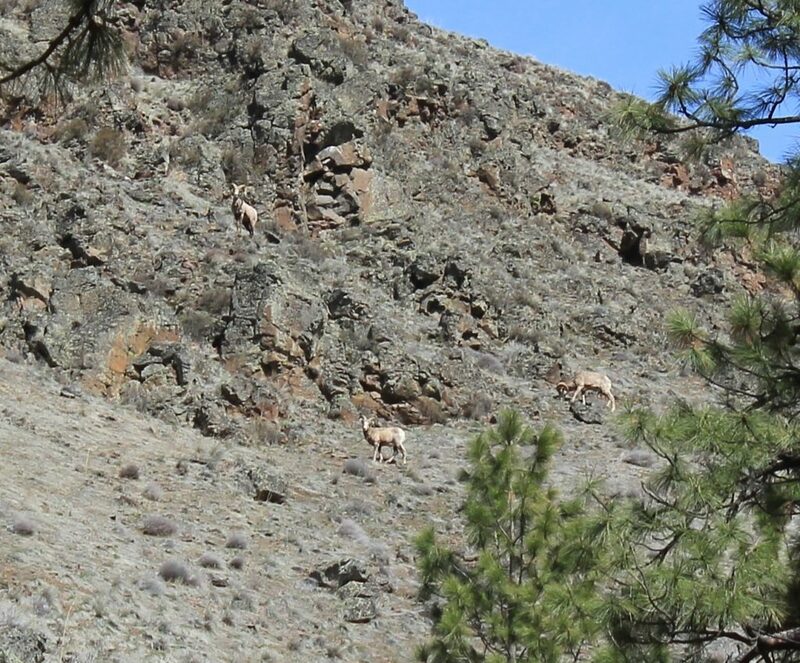 We were also sad to discover the remains of a dead bighorn ewe at the base of some towering cliffs. And in a sure sign of spring, we encountered our first tick of the year. We’d been expecting this, so it was no surprise when I found the little blood sucker crawling up my leg. We spent much of the week preparing for some upcoming travels. 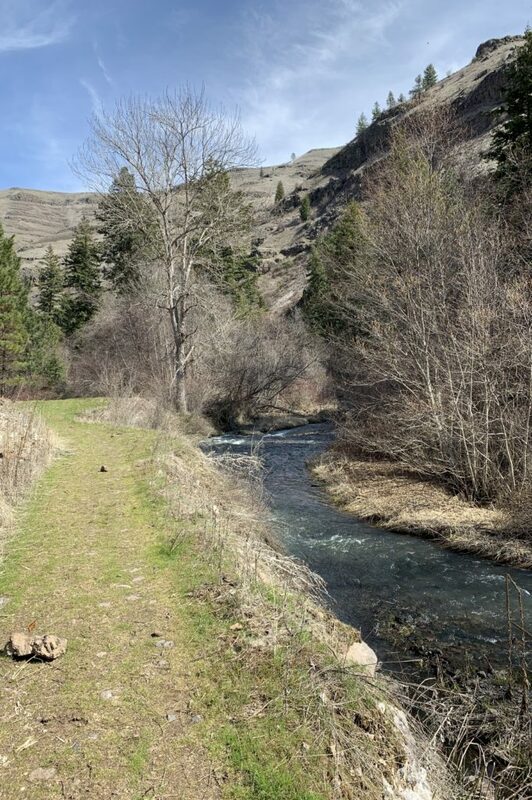 First, we’ll be spending a week at my cousins in the Yakima, Washington area. Jerry and Shantel have a nice place with a few acres on the edge of town. They’ve been generous enough to offer us parking anytime we’re in the area. 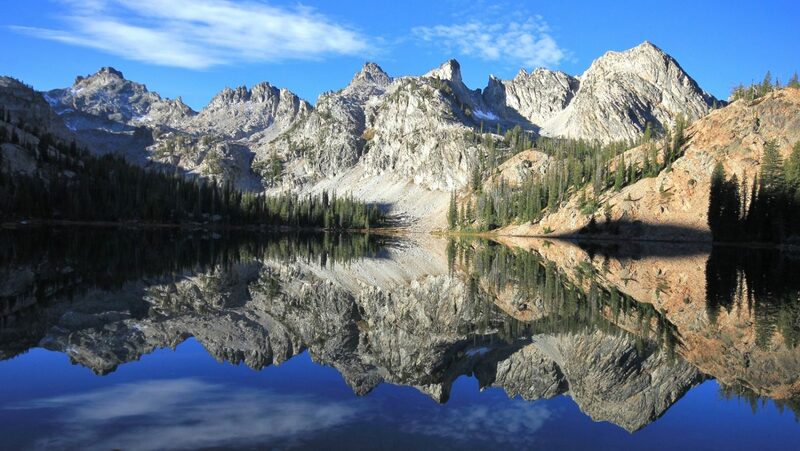 We’re excited to spend time with family and take in some local hikes that have been on my bucket list. 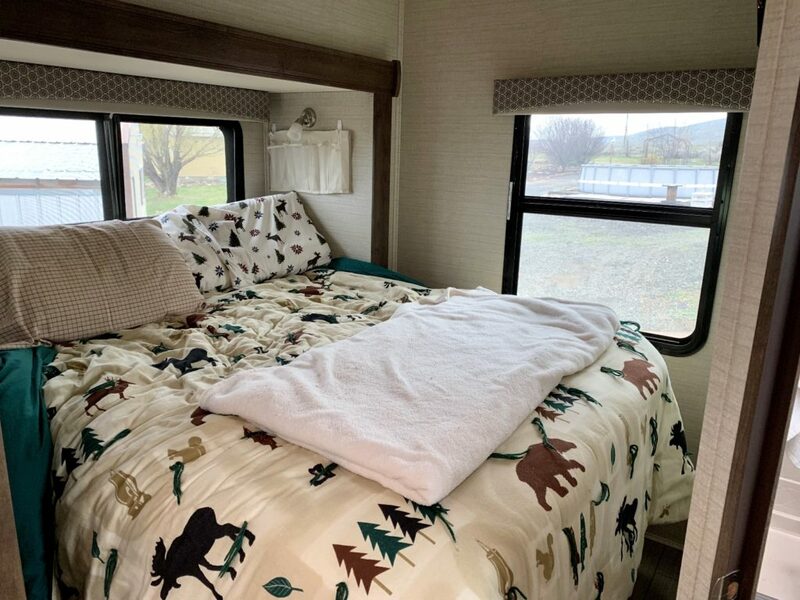 We’re also excited for another RV first—our first time “moochdocking”. Moochdocking is camping in the yard or driveway of a family member or friend. If you are lucky enough, like we are, you are allowed to plug into water and electricity. 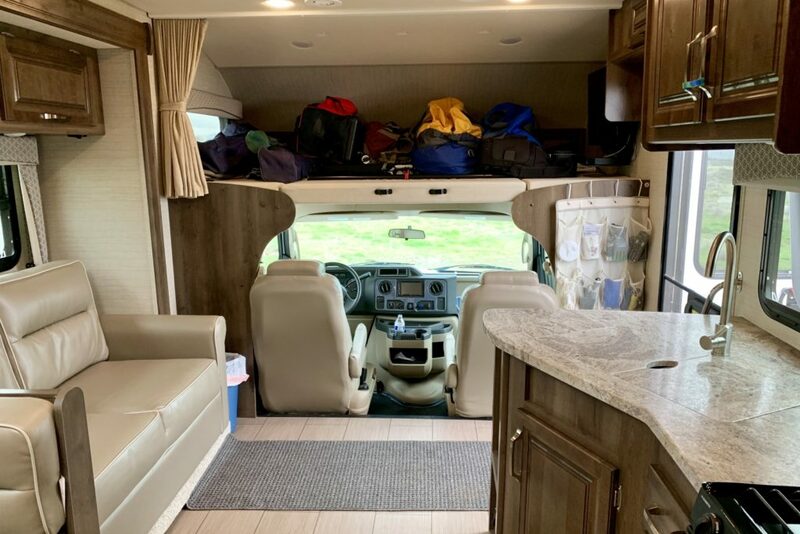 We’ve RV camped quite a bit over the years (going back to our travel trailer days) and we’ve never once camped with hookups of any kind, so this will be a real treat! After Yakima, we’ll be heading to the Columbia River Gorge for a week of boondocking and hiking, weather permitting. That’s the great thing about this new life, we have the time and ability to be flexible around the elements and all of life’s surprises. 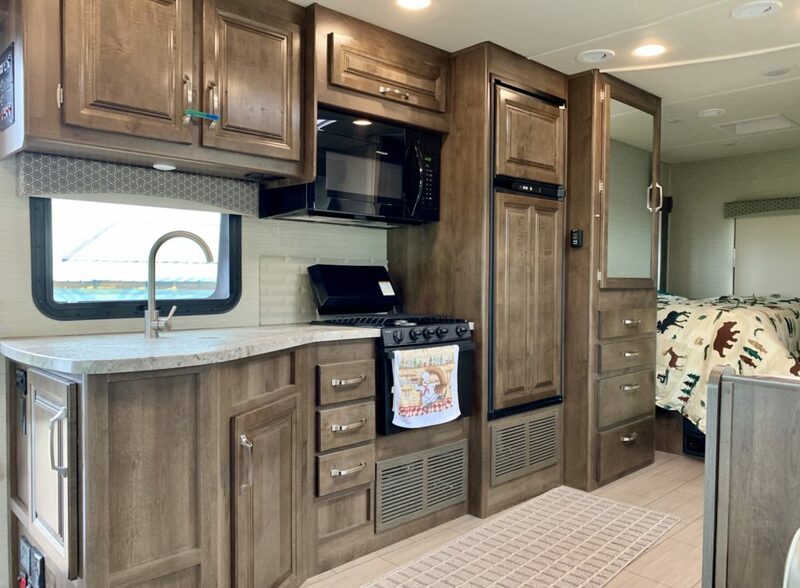 We’ve posted a few photos of the exterior of our 2019 Jayco Greyhawk 26Y, but I realized we haven’t shown you much of the interior yet. We’re still organizing and figuring things out, but here’s a look at what it looks like so far. 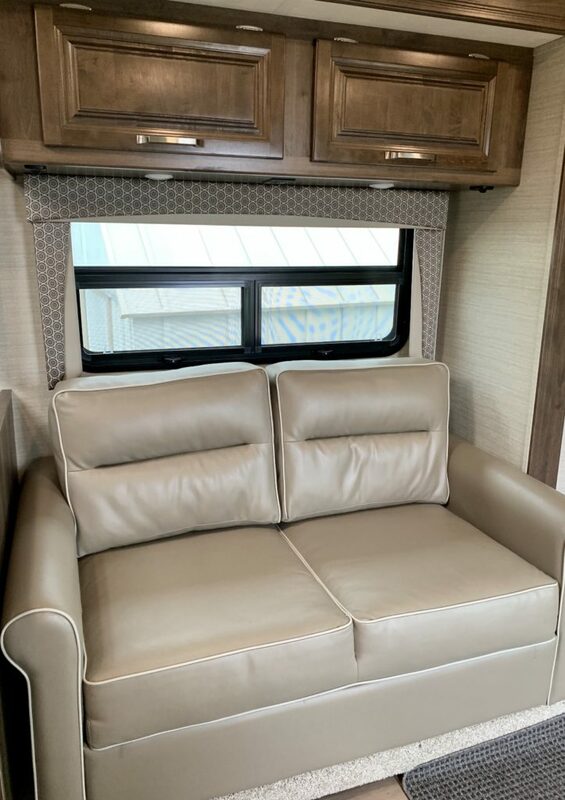 One of the things we like the most about our floor plan is the large slide with tri-fold couch and dinette. This really opened up the main area and made it feel more livable compared to most other class C’s we were seeing in this size. And while we’ve seen others complain about the tri-fold couch, we’re loving it. It is comfortable and versatile for our needs. So far we’ve used all three configurations: couch, bed, and 2/3 out for reclined seating while watching T.V. 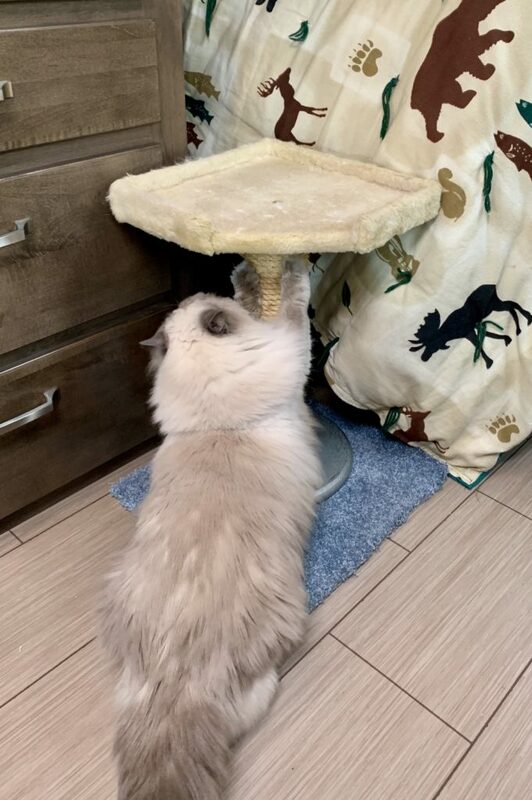 My favorite recent addition is the combination scratching post/step stool that Jason crafted for Jake and Indy. 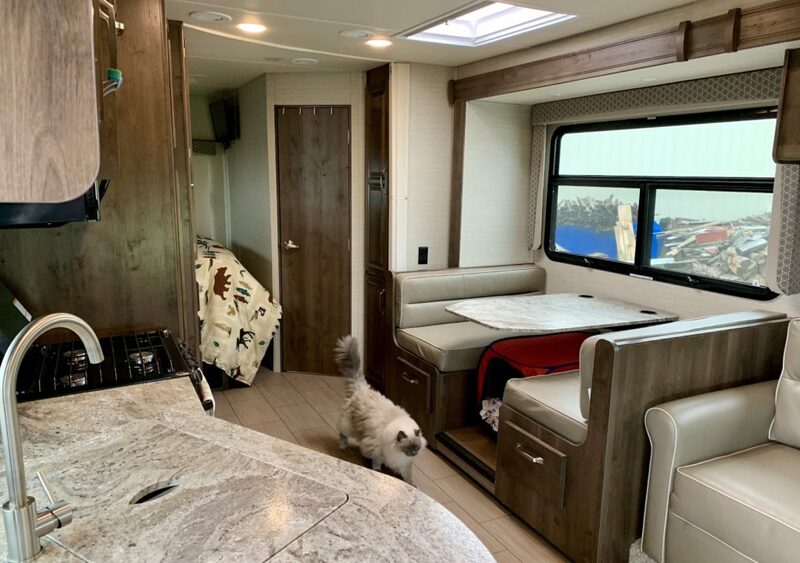 The boys have always been great about using their scratching posts, so we knew we’d need one for the RV. The other thing we discovered on our first trip with the boys is that the bed is quite high (I can barely crawl in). Jumping down is hard on their aging “big boy” joints. We wanted some sort of step stool for them, but our floor space is extremely limited. 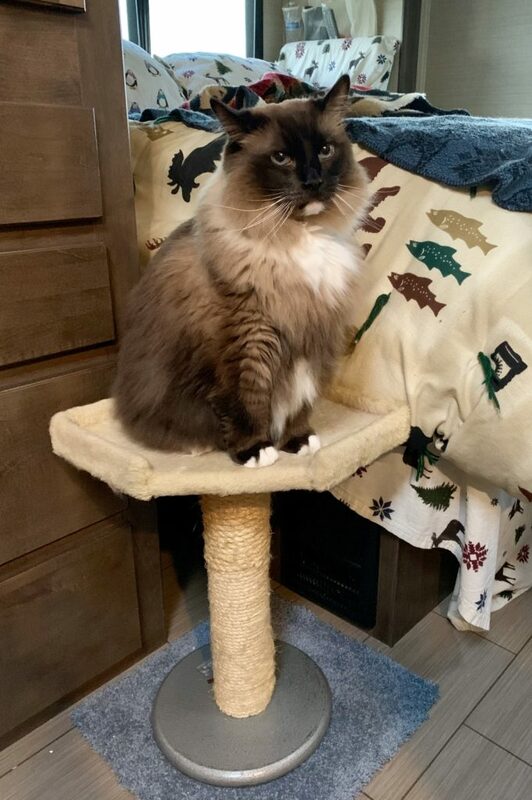 With that, I give you the boys combination scratching post and step stool—a 25 pound weight bolted to a perch from their cat tower. As you can see, the boys are loving it for both purposes. 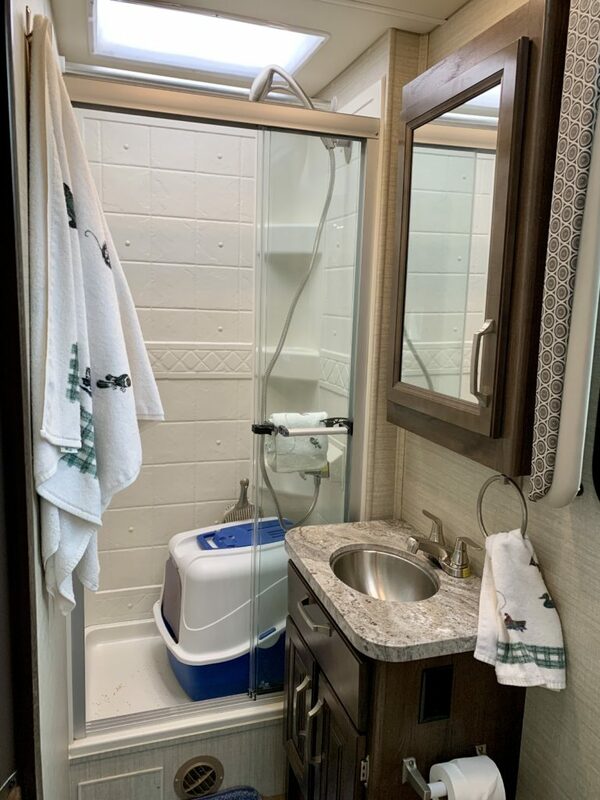 I loved seeing how you have arranged and fixed up the interior of the Motor home. Especially to make Jake and Indie feel at home. You mentioned how high your bed is. I have a small step stool by our bed too but, Russ suggested getting a fold up step stool at Walmart for me to get into the car easier. I did that and it might work for you. I t is 9 inches high. Jus right for me and folds up to be put out of the way. Just a suggestion. Thanks for the tip Mom! We have a two step, plastic step stool in here now for us. The cupboards are so tall that I need it for those and it helps getting into bed. But I’m intrigued by the folding one. We’re running to Walmart today so we’ll see what they have here! The boys look like they are enjoying the travel life since the first initial trip. I am sure they are much happier being with you and Jason as opposed to being home alone for several days. I can’t believe all of the lady bugs!